It seems like every new fitness band on the market has a built-in heart-rate sensor, but now headphone companies are baking sensors into their devices, too. The ear has become a popular place to put a sensor, because properly fitting earphones will stay put and presumably measure your heart rate more accurately than a wrist-worn sensor prone to moving around during exercise. That’s why companies like Samsung, JBL, Jabra, and Bose are shipping biosensing Bluetooth earphones designed for workouts. Wearable technology company LifeBeam raked in $1.7 million on Kickstarter last summer to produce a new kind of heart rate-tracking headphones called Vi. And while Vi has an optical heart rate sensor built in, that’s not really its selling point. What sets these headphones apart is Vi herself, a voice coach rooted in artificial intelligence that guides you through your workouts. There are several fitness apps with voice-coaching that aren’t tied to a specific pair of headphones, but those trainers sound like robots. Vi actually sounds like a person you’d want to talk to—and you can. Vi was a Kickstarter success story, but it doesn't look like crowdfunded hardware. Like most Bluetooth headphones, Vi comes with a sizing kit of gel tips and fins so you can customize the earbud fit to your ears. This part is important, because if the headphones don’t fit properly, they won’t be able to track your heart rate. Also included in the box are a small carrying case and a USB charger. These headphones get up to eight hours of battery life on a single charge, which means you can squeeze in a few days of run-tracking or charge them at night if you’re wearing them all day. To power on the headphones, press the multifunction button on the right side of the neckband. Vi introduces herself with a robot joke, and this is where you’ll notice that her voice is unlike other fitness-coaching assistants in other apps. It’s more…human. More conversational. Even when giving you a readout of your pace, mileage, and heart rate, Vi sounds like a person and not a bot. Make sure you pick the right size earphone gels and wings to get a good fit. Install the Vi Fitness app (available for iOS and Android) and pair the earbuds with your phone in your Bluetooth settings, as is standard for wireless headphones. Then tell Vi your name in-app. She’ll ask you how to pronounce it, and if she can’t get it right, she’ll ask you to pick a nickname. She’s gonna be talking to you a lot, so make sure you pick a name you’ll want to be called. Vi’s heart rate data, once you properly position the left earbud’s optical sensor, is spot on. I compared Vi’s stats to my Apple Watch Series 2, which is one of the most accurate heart rate-tracking bands I’ve tested, and the two matched up almost perfectly. The earphones have a built-in microphone with noise cancellation so you can ask Vi to tell you your stats while you run by tapping your right earbud. In my experience running with these headphones through Brooklyn over the past week and a half, Vi doesn’t always know when you're speaking. The combination of tall buildings, trees, and my run-induced breathlessness certainly didn’t help, and Vi’s response time to an earbud tap had an annoyingly long lag. I ended up eyeing my stats in-app while pausing at stoplights rather than ask Vi to give me the rundown. Vi's app for iOS averages your total mileage and also graphs data from each run. You can’t actually hold a conversation with Vi, so don’t think of this AI assistant as a real-life version of Samantha from “Her.” Vi is more like Siri for workouts, but with a much more pleasant tone. I’m always a little skeptical when it comes to crowdfunded hardware, but Vi’s design and quality are top-of-the-line. The earbuds attach to the neckband via magnetic tips, which are strong and stay in place as you move. The neckband is comfortable to wear on long runs. The sizing kit that comes with the headphones helps to ensure that the heart rate sensor is snuggled perfectly inside your ear, and Vi offers video tutorials in-app to help you get the right fit. But I also wish Vi would alert you when she can’t detect your heart rate. I lost a few minutes of data when my earbud shifted slightly on a windy day (unbeknownst to me), and didn’t realize it until I looked at the app screen. Other heart rate-sensing headphones offer this, and Vi should, too. That’s an easy enough fix, and one I hope is made soon. 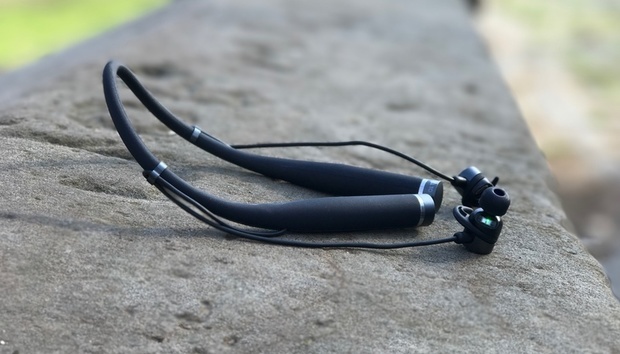 But the 1.3-ounce headphones are incredibly lightweight and boast a barometer, accelerometer, and gyrometer so you get more than just heart rate data when you put in your miles. Vi logs your steps, distance, cadence, and speed, and even averages out your pace per mile across every run, which is useful. These headphones are perfect for outdoor runners, but they're a little too expensive for other fitness buffs. What Vi can do: Track your heart rate accurately and offer helpful advice on how to improve your running in a way that won’t make you want to rip your headphones off mid-workout. What Vi can’t do: Track anything that’s not outdoor running (yet), sync with third-party health apps, or integrate with music apps outside of Spotify—and even then you need a premium account. LifeBeam working on making Vi a more well-rounded fitness coach by adding third-party integrations and more workouts. But for now, Vi’s usefulness is limited to those who run outside. The coaching won’t work for indoor running, walking, cycling, circuit training, or any other type of exercise. LifeBeam CEO Omri Yoffe told me the company is hyper-focused on nailing this specific feature, and it has. But for a $250 pair of headphones designed around fitness coaching, Vi has to add other workouts. Quickly. Other heart rate-sensing earbuds cost about $100 less. But these headphones have so much potential. Vi is the first conversational voice assistant I’ve used that I actually wanted to talk to. Future software updates will bring expanded exercise-tracking and guided workouts, and then Vi will be a truly personal trainer. But until then, this device is simply a solid set of headphones. With comfortable gel tips and Harman/Kardon sound that’s great for listening to music and taking calls, Vi nails that part. The fitness-coaching part is almost there. But not quite. Vi goes on sale online on April 17 with widespread retail availability expected in June. How do global privacy laws stack up to GDPR?